Chang'e is one of the playable Gods in SMITE. The rabbit moves at 3.5x of Change's Movement Speed. The item fetch portion is disabled in the Assault game mode. It's hitbox sweeps left to right in a cone in front of Chang'e. It's hitbox moves clockwise around Chang'e. The area persists for .7s. Allied gods within 70 units have their Healing increased by 10%. If you have taken or dealt damage in the last 5s, their Healing is increased by an additional 15%. Any god affected by your ability heals gains 20 increased Physical and Magical Protection for 5 seconds. If you drop below 40% Health, you gain a shield equal to 20% of your maximum Mana. The shield lasts 6s. This effect can only occur once every 90s. As Chang'e evade an enemy ability using Moonlight Waltz that would have hit you for 500 damage or more. Chang'e is Hou Yi's wife. As imagery goes, Hou Yi came to represent the sun, while Chang'e represents the moon. 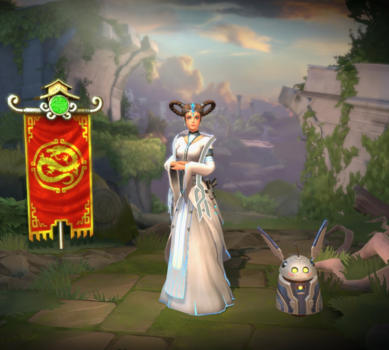 In her Default and Moonlight Love skins, Chang'e herself doesn't speak. Instead, her Jade Rabbit talks in most of her voice lines. One of Chang'e introduction quotes, "You can dance if you want to! ", is a reference to the 80's song The Safety Dance by the Canadian band Men Without Hats. One of Chang'e's jokes, "The hare always win! ..Right guys?" is a reference to the children's fable The Tortoise and the Hare. One of Chang'e's taunts, "What's that?! You keep a rabbit's foot for good luck?! Well that's just sick! Take a lesson from my girl, she keeps the whole rabbit!" is a reference to the myth of the Rabbit's Foot. 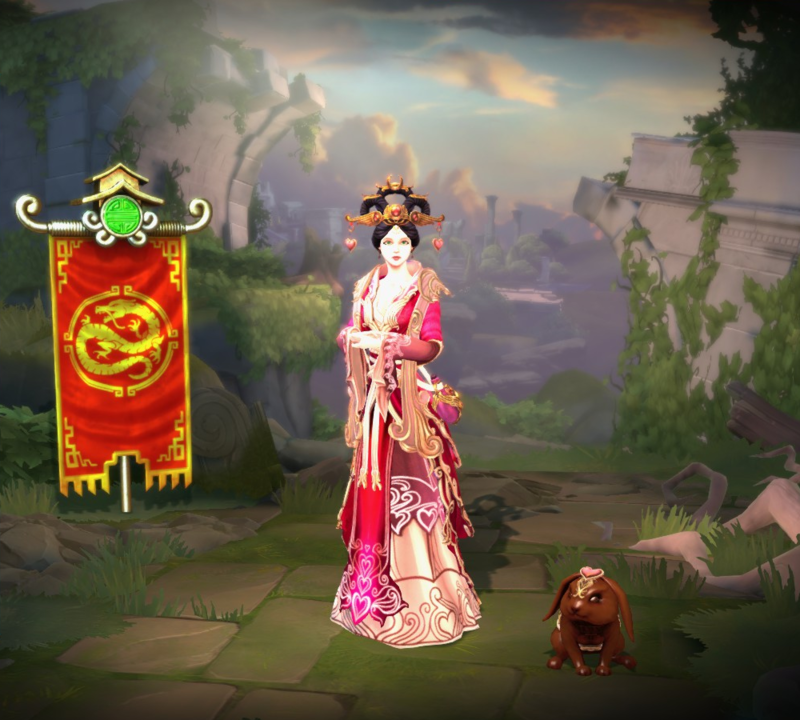 Both Chang'e's taunt, "I'm the most foul, cruel and bad tempered rodent you've ever set eyes upon! ..Oh, her? Yes, well.. she is with me." and the joke "I'm not Behind the rabbit, I Am the rabbit!" are references to the 1975's comedy movie Monty Python and the Holy Grail. When Chang'e's jade rabbit is away from her while fetching an item, it sometimes says "..I knew I should have taken that left at Albuquerque..". This is a reference to one of Bugs Bunny's catchphrases. 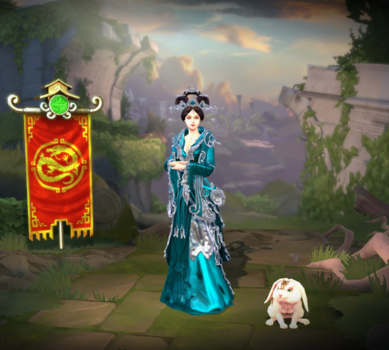 When Chang'e's jade rabbit delivers an item, it sometimes says "I'm late, I'm late! ..For an extremely critical appointment.". This is a reference to the famous fairy tale Alice in Wonderland. 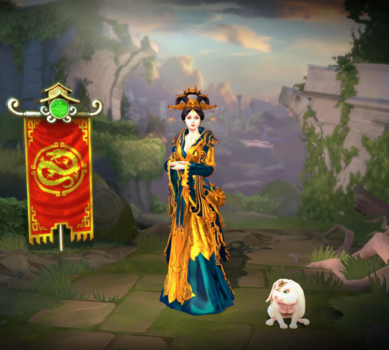 This skin was released in conjuction with Moon's Groom Hou Yi. The first card art for this skin was removed due to the artist have copy the art of another game. 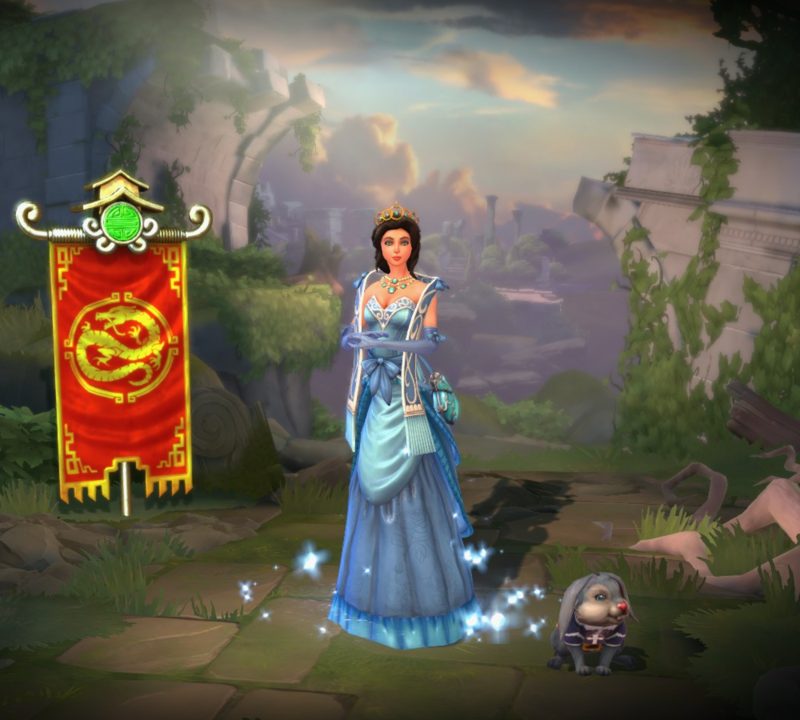 This skin is based on a Fairy Tale princess. More specificaly, she is based a lot on Cinderella. This skin share its theme with Cursed King Cernunnos. In this skin the rabbit is voiced by Christopher Sabat, who also has voiced Anhur, Fenrir, He Bo, Countess Chang'e's bunny, Spellbound Chang’e and Zeus. 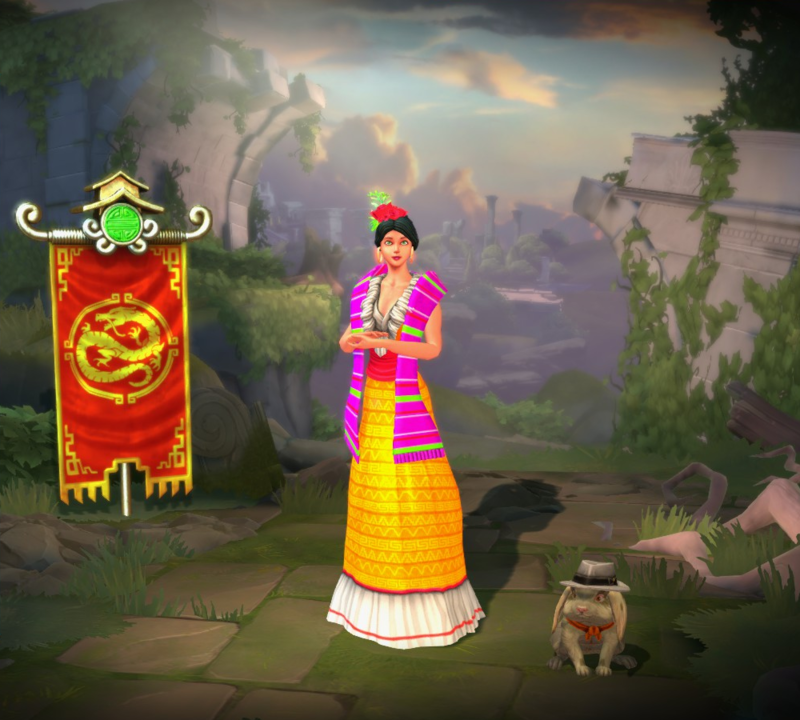 This skin was originally a reward granted for migrating your Hi-Rez account to either the LevelUp LATAM or Brazil regions. This is the only Chang'e skin where the bunny doesn't talk. 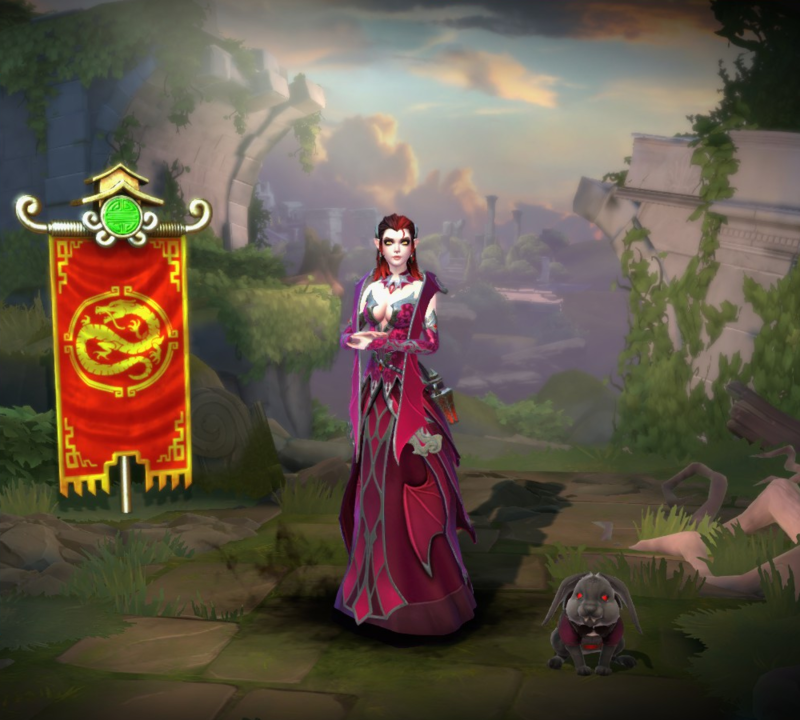 This skin is based on an Vampire. In this skin the rabbit is voiced by Christopher Sabat. This skin share its theme with Count Baron Samedi and Scarlet Coven Isis. This skin could have been based on the anime Little Witch Academia. This skin share it's theme with Aphra Cadabra Aphrodite. 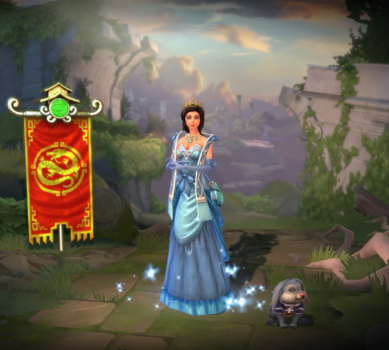 This skin is based on the character Princess Leia from the Star Wars movie franchise. Increased Cooldown from 5s to 6s. Increased persist time of damaging area from .6s to .7s. This fixes the “dead zone” where Chang'e could miss the ability while standing still. Now goes the full 360 degrees. Increased Cooldowns from 20/18/16/14/12 → 20/18.5/17/15.5/14. Increase Speed to run to Base from 1.7x Player's Speed → 3.5x Player's Speed, decreasing trip time from ~44s → ~34s with Boots in Mid Lane. Decreased setup time .1s → 0s. Decreased Magical Power Scaling on Heal from 40% → 30%. Increased Magical Power Scaling on Damage from 30% → 50%. Scaling on the healing portion of this ability increased from 30% → 40%. Healing increased from 40/60/80/100/120 → 50/70/90/110/130. Damage increased from 50/75/100/125/150 → 65/90/115/140/165. Fixed mute not applying when using skins that have the Rabbit speak. Fixed Rabbit Passive meter not changing color to Moonlight Love skin. Improved the accuracy of the Arc. Fixed an issue with the magical scaling of this ability not applying properly. Increased speed for Jade Rabbit to shorten time he takes to purchase items. Fixed Rabbit not returning with Actives and Consumables purchased if using Auto Buy. Updated description to say that it also gives mana for dodging Basic Attacks. Fixed issue where Jade Rabbit would get stuck on a wall in Joust map. Fixed tooltip to no longer say it affects allies. Fixed some issues where the Jade Rabbit wouldn't play voice over when purchasing items. Fixed being able to cancel ability and not take cooldown or mana cost. This ability can no longer be cancelled. Updated tooltip to reflect that it only stuns gods. Bunny no longer removes back door protection from towers. Recovery time reduced from 0.6 to 0.1. Recovery time reduced from 0.5 to 0.1. 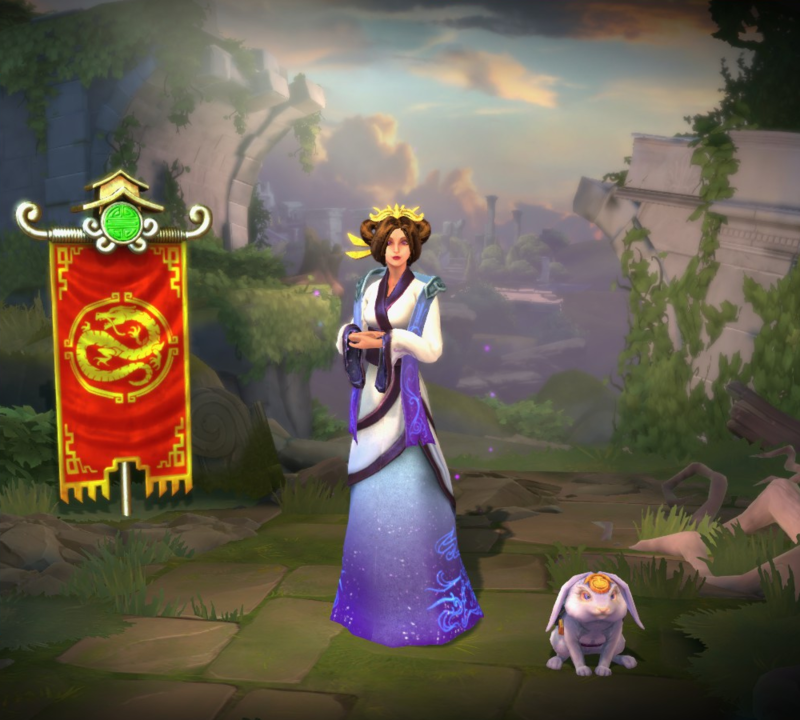 Chang’e’s default loading screen card and portrait have changed. No longer grants a protection buff. Now grants magical protection in addition to physical protection. Protections granted to allies increased from 10/15/20/25/30 to 20/25/30/35/40. Healing reduced from 50/75/100/125/150 to 40/60/80/100/120. The projectile’s width has been reduced by 25% to match that of the targeter. Fixed the rabbit getting stuck near the Phoenix in Joust. Fixed an issue in which some of her Recommended Items were not properly referencing the highest ranks whereas Sprint and Meditation were incorrectly using the highest ranks. No longer gains magical protection with each level, to be consistent with other mages. Reduced the invulnerability duration and fire time by 0.2s on the tail end. Reduced damage and healing from 50/80/110/140/170 to 50/75/100/125/150. The evasion now occurs 0.1s earlier to better match the animation. This ability has been changed so that the amount of time that she is unable to be hit has been increased from 1s to 1.2s. The base damage of this ability has been reduced from 175/250/325/440/475 to 160/235/310/385/460. The cooldown on this ability has been increased from 4s to 5s. The amount of time that this ability fires, and that she evades, has been reduced from 1.4s to 1s. The cooldown on this ability has been increased from 14/13/12/11/10s to 20/18/16/14/12s. The cooldown of this ability has been changed from 16/14/12/10/8s to 14/13/12/11/10s. The additional amount that she heals herself when healing a god has been reduced from 50% to 25%. The cooldown of this ability has been increased from 8s to 10s. The magical power contribution of this ability has been reduced from 100% to 70%. Chang'e has been added to the game. This page was last edited on 9 April 2019, at 18:16.